I spend an inordinate amount of time cooking for me. This is a consequence of choosing to leave my very comfortable childhood home in Malaysia and settling down in Singapore because the job opportunities were better – HOWDAREME?! But seriously, having come from a home where my mom made amazing food for a family meant that I only knew how to cook FOR A FAMILY. Over time I’ve learned how to cook in batches, eat a lot of salads, freeze portions, etc. Sometimes though you just want to make enough for the night and not have a bunch of stuff leftover that you have to heat up because microwaves are evil/you’re picky like that. I’m not picky like that but apparently OTHER people are. 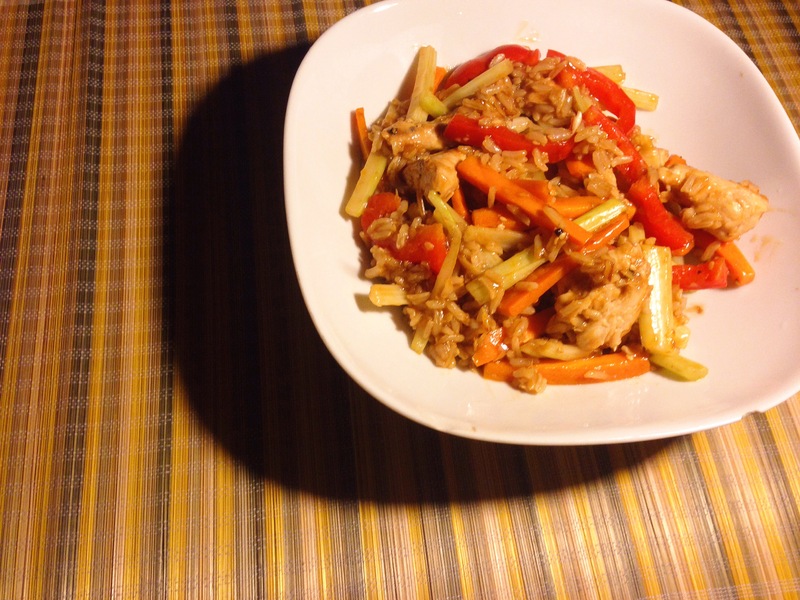 This stir-fry is perfect for those nights when you want something warm, filling and spicy/flavorful/Asian yum. Heat oil in a non-stick pan large enough for all your stuff over a medium to low flame. Put the celery, carrots, red pepper and onions in the pan and fry for 3 minutes, stirring occasionally. While you’re doing this, prep the sauce by mixing all the sauce ingredients together in a small bowl except the cornstarch and water. Mix the cornstarch and water separately in another bowl till the cornstarch dissolves. Add the cornstarch + water mixture to the other sauce ingredients and stir till combined. Pour over the stir-fried veggies. Stir until a bit thicker about 30 seconds to 1 minute. Add the pre-cooked rice and protein accompaniment. Increase the flame to medium and stir for 1 to 2 minutes. Remove from heat and EAT! *The sauce recipe is for a very reasonable amount of stuff meant for one person only. Adjust if serving a crowd.